A few months back I zipped over to New Zealand and rode around the North Island for 10 days on motorbikes 5 mates and I hired from Te Waipounamu Motorcycle Tours. On Day 4 of the trip one of the motorbikes didn’t start for some reason. Anyway, a quick call to John back in Auckland had his right hand man Aidan quickly come to the rescue on his trusty white steed…………..okay, okay, it was a white van with a replacement motorbike in the back. No hassle, no drama – a straight swap and we were away. Part of what I do when I go away on my trips is I pop up a web site and do a few reviews of the places we went, the hotels we stayed in and the services we used. 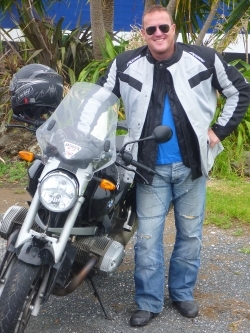 So I did a web site for my New Zealand motorbike trips (note: I haven’t finished the North Island write ups as yet). We were thrilled with the quality of motorbike hire from Alison and John so mentioned their motorcycle hire business in New Zealand here. As it happens, Alison is one smart cookie. She’s embraced social media marketing and promotes the business very well via Facebook. And she’s now a Facebook friend of mine. A few days back, I happened to mention that I was writing up our trip online and sent her a link where I reviewed her motorcycle hire business. Remember, one of the biggest barriers to buying is the perception of risk associated with the purchase. If you can demonstrate to your potential customer that you’re safe to buy from, then your chances of making the sale rise dramatically. “Had an interesting enquiry yesterday, one of the questions was what our road side assistance policy was. The fact that our group had a problem was an a great opportunity for Te Waipounamu Motorcycles. It was an opportunity to shine. The problem allowed Alison’s team to demonstrate their commitment to ensuring their customers have a smooth and trouble free riding holiday – basically to show off just how good they are! They did that and then that story can then be used – if the recipients talk about it – as a super strong key marketing message. Our problems almost certainly means that Alison will make sales she might not have otherwise made. And with a sale most likely being around $1,000 (I’m guessing), it can be worth quite a lot of money. Remember, not all customers are equal. Some aren’t worth a hill of beans, whilst others can explode your business. And problems aren’t always problems. Often they’re opportunities.